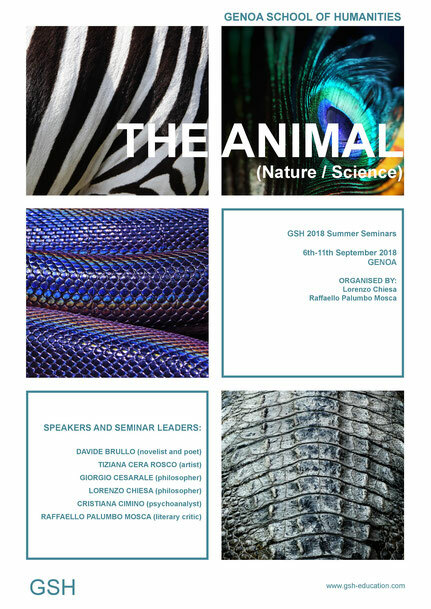 In the 2018 Summer Seminars, we will focus on the animal in its close connection with nature in general and science as today’s hegemonic discourse. Our interdisciplinary approach will be from the standpoints of philosophy, psychoanalysis, poetry, literary criticism, and fine art. Since its origins, Western philosophy has given great importance to the thresholds that would allegedly separate the non-rational life of the animal from both the political commonality of human beings as endowed with language and the life of plants as merely nutritive and reproductive. But the modern state, which was founded theoretically on the exclusion of a state of nature where “man is wolf to man”, has now been mostly reduced to the anarchic administration of the bare life of human animals increasingly deprived of basic rights (terrorists, migrants, precarious workers), if not surviving in a semi-vegetative condition (the terminally ill, so-called “lifers”). How do Agamben’s critique of biopolitics and Derrida’s investigations of the “animal that therefore we are” help us to clarify this predicament? Are the current weakening of the state and concurrent withering away of traditional sovereignty inevitably doomed to pave the way for an apocalyptic, and unprecedented, “war of all against all”? The consolidation of Darwinism as a dominant scientific paradigm in turn problematised the natural divisions created by classical philosophy and Christian religion. On the one hand, evolutionary theory seems to have refuted anthropocentrism. On the other hand, it still widely relies on a genetic determinism that runs the risk of projecting onto animality a human-all-too-human model of competition and selection (the “survival of the fittest”). Can Freudian and Lacanian psychoanalysis contribute to elucidating this conundrum? Is human sexuality fundamentally different from animal sexuality? And, if we assume that the former revolves around the sexual difference between woman and man as symbolically constructed categories, how should we map this difference back onto the animal while avoiding both a sexist naturalisation of woman as unable “to attain the ideal” and a hysterical bestialisation of man as “predatory”? The animal has always played a central role in literature, from Aesop’s fables to Kafka’s nightmares, Borges’s bestiaries, Montale’s ornithology, and Ted Hughes’ zoology. How do the more recent engagements of prominent novelists, including Ishiguro and Houellebecq, with the dystopian possibilities created by cloning complicate the already tenuous border between humans, animals, and plants? Can the writer emerge as the spokesperson for a renewed notion of pietas capable of tackling the ethical dilemmas of a highly advanced – and potentially uncontrollable – technological society, which more and more sees itself as post-human? Conversely, in what sense could one claim that, following the title of a well-known story by Henry James, the poet is himself a beast in the jungle of bodies and signs, whose savage identity awaits to be fully unfolded? Would it be possible to reverse this very identity, extended to the artist’s practice, into a “spiritual hunt”? Davide Brullo is a poet and novelist. His novels include Il lupo [The Wolf], Rinuncio [I renounce], Ingmar Bergman: La vita sessuale di Kafka [Ingmar Bergman: Kafka’s Sexual Life], Pseudo-Paolo. Lettera di San Paolo Apostolo a Pietro [Pseudo-Paul. Saint Paul’s Letter to Peter]. He translated from Hebrew into Italian the Book of Psalms, the Book of Lamentations, and The Book of Wisdom. He published the following books of poetry: Annali [The Annals], L’era del ferro [The Iron Age], Abbecedario antartico [Antarctic Primer], Lettera a Ushuaia. As a cultural journalist he collaborates with Il Giornale and Linkiesta. He is the editor in chief of the magazine Pangea (pangea.news). Giorgio Cesarale graduated from the University of Rome “La Sapienza”, where he also obtained his PhD in Philosophy. He has been Wissenschaftlicher Gast at the Hegel-Archiv of the Ruhr-Universität Bochum, visiting scholar at the Philosophy Department of the Boston College (USA), and visiting fellow at the London School of Economics. Currently, he is Associate Professor of Political Philosophy at Ca’ Foscari, University of Venice. He serves as a member of the editorial board of Micromega and as a corresponding editor for Historical Materialism. His major publications include: La mediazione che sparisce. La società civile in Hegel (Carocci, Rome 2009); Hegel nella filosofia pratico-politica anglosassone dal secondo dopoguerra ai giorni nostri (Mimesis, Milan 2011); Filosofia e capitalismo. Hegel, Marx e le teorie contemporanee (Manifestolibri, Rome 2012). He edited (with Mario Pianta) Giovanni Arrighi’s Capitalismo e dis(ordine) mondiale (Manifestolibri, Rome 2010). He is now attempting to rethink critical theory in the light of the concept, derived from Hegel’s philosophy, of “reflected negativity”. Lorenzo Chiesa is a philosopher who has published extensively on psychoanalysis, biopolitics, Marxism, and European thought. His main works include Subjectivity and Otherness (MIT Press, 2007); The Italian Difference (Re. press, 2009) (with A. Toscano), Lacan and Philosophy (Re.press, 2014), Italian Thought Today (Routledge, 2014); The Not-Two (MIT Press, 2016); and The Virtual Point of Freedom (Northwestern UP). He is currently working on a book on bureaucracy. Chiesa serves as Director of the GSH, and teaches at the Freud Museum of London and at the Freud’s Dream Museum of St Petersburg. He is the editor of a new book series on Italian radical thought (“Insubordinations”) at the MIT Press. He was previously Professor of Modern European Thought at the University of Kent, where he founded and directed the Centre for Critical Thought. He held visiting positions at numerous institutions, including the University of New Mexico, the European University at St Petersburg, the Istituto di Scienze Umane of Naples, the Institute of Philosophy of Ljubljana, the American University of Beirut, and the Jnanapravaha of Mumbai. Raffaello Palumbo Mosca is Director of the GSH and a literary critic. He holds a PhD with honors in Romance Languages from the University of Chicago and a PhD in Italian literature from the University of Turin. He has taught Italian literature in the US (University of Chicago) and the UK (University of Kent). He is the author of a number of essays on modern and contemporary European literature and history of literary criticism published in American and European journals (“Lettere Italiane”, “Modern Language Notes”, “Raison Publique”, “Nuovi argomenti”, “Studi Novecenteschi”, and others). His book L’invenzione del vero. Romanzi ibridi e discorso etico nell’Italia contemporanea won the International Tarquinia-Cardarelli prize in 2014. He is also a reviewer for Books In Italy and an author for the publishing house Zanichelli.